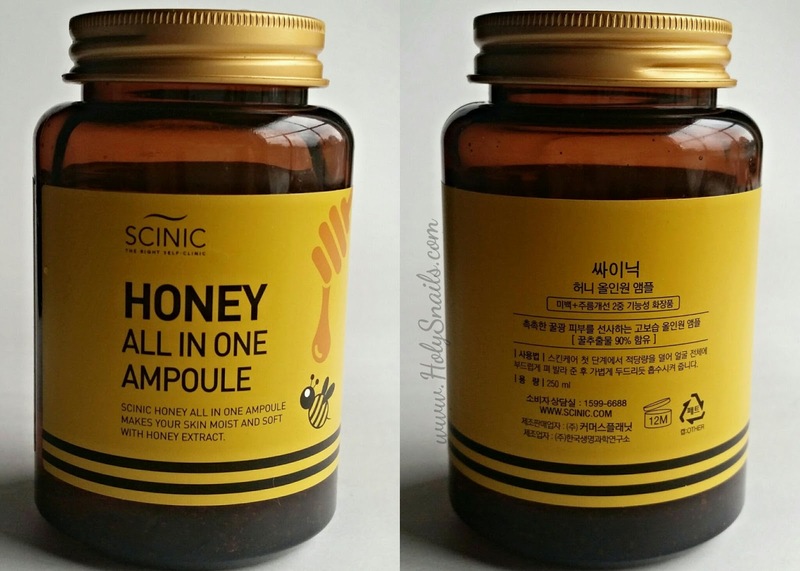 Scinic Honey All In One Ampoule | Holy Snails! Y'all, I'm trying to finish the Vitamin C post, I swear. I just get so drained working on it, I burn out and pretend I don't have a blog for a couple of days before repeating. It's actually ~80% done, if that's any consolation. Also, I got SnapChat now, and I post some DIY stuff on there. My handle on there is "theonetruesnail" if anyone wants to follow along. I've been posting on Instagram a lot, if anyone wants to follow me on there too. I'm also revising how I review products, and am in the process of going back and standardizing my old reviews. 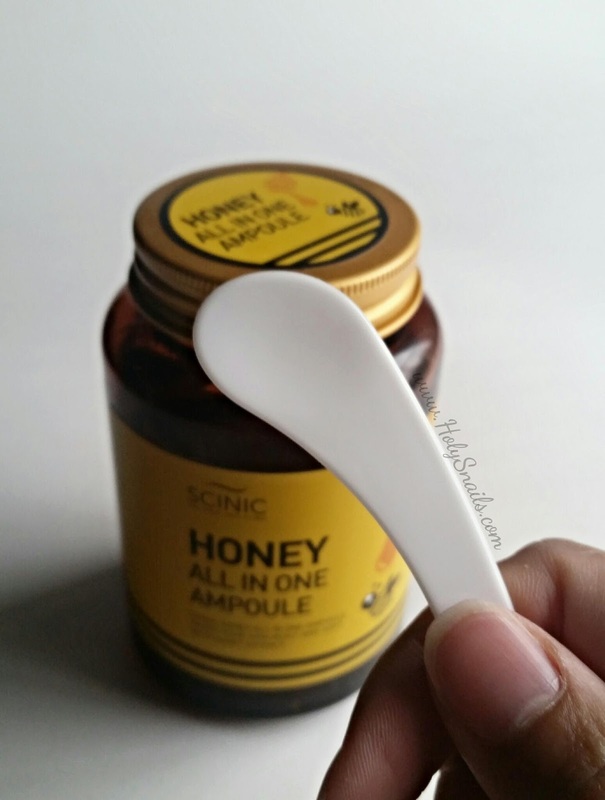 Today though, I'll be reviewing something I'm pretty excited about, the Scinic Honey All-In-One Ampoule that I got from my first Avecko order. Contains 90% Honey Extract! 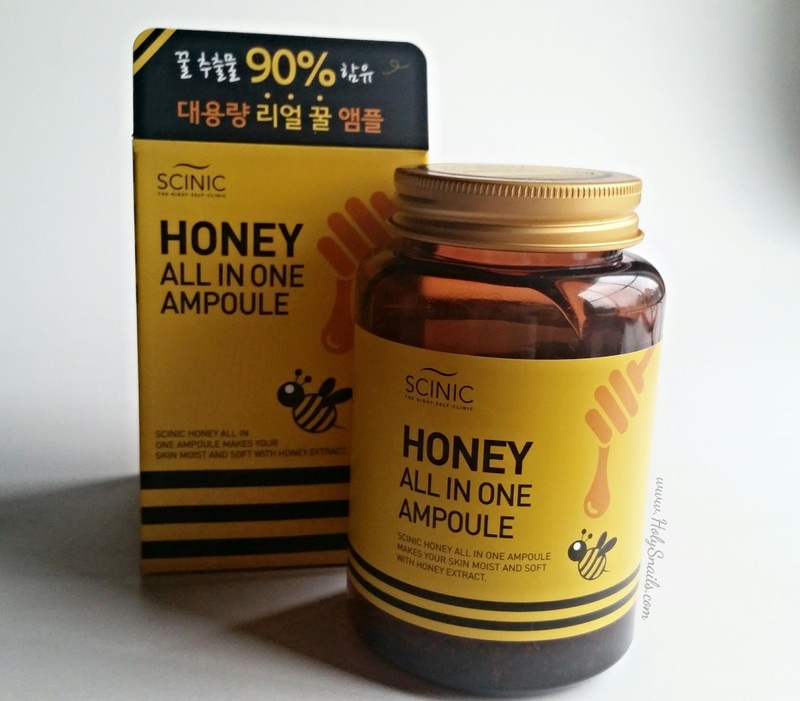 Scinic Honey All in One Ampoule makes your skin moist and soft with honey extract. Scinic has been around for a while, but doesn't get as much buzz as say, the typical roadhouse brands like Missha, Etude House, or Innisfree. This is my first product from them, and I can't wait to try more. Potential acne triggers are listed in red. Potential irritation triggers are listed in orange. A general rule I read about when I got into DIY (particularly, DIYing dupes) and skincare ingredients was to assume that after the first 5 ingredients, everything else listed is 1% or less. This isn't a hard rule, but it's a pretty good starting point. This makes this ampoule even more attractive, as its first 5 ingredients are 90% Honey Extract (moisturizing), Glycerin (humectant), Water (solvent), Niacinamide (brightening, moisture barrier, ceramides, acne, collagen, and so much more), and Royal Jelly Extract (high in Vit B, anti-inflammatory). It has some popular hanbang extracts like Licorice Root (11th, brightening) and Scutellaria Baicalensis (9th, antioxidant, anti-irritant). There are more lower down on the list, which also contribute some antioxidant and anti-inflammatory properties. Other notable, although probably in too low of concentration to matter, ingredients are Fermented Soybean (antioxidant), Green Tea Leaf Extract (anti-inflammatory, antioxidant), Centella Asiatica Extract (anti-inflammatory), Hydrolyzed Silk (moisturizing), and Adenosine. If you're a Bio kid, Adenosine is the A in ATP, and something you really only hear about during photosynthesis/cellular respiration week. As a drug, it is used as a cardiac depressant and vasodilator. For cosmetic purposes though, Paula's Choice, known for being quite conservative in ingredient claims, considers it a cell-communicating ingredient with anti-inflammatory properties. Some other sites claim it's an anti-wrinkle superstar, and there are some studies indicating its potential as an effective anti-aging ingredient. From what I've found, it's effective at 0.1%, so that's great news even when it's low in an ingredients list. This does not contain alcohol, and seems pretty clean from the CosDNA sweep. Carbomer (thickener) and Triethanolamine (pH adjuster) are very commonly used in skincare products, and have studies backing their safety at the typical concentrations used. It does contain fragrance, although I definitely don't find it overwhelming. It smells like real honey, straight from the jar. 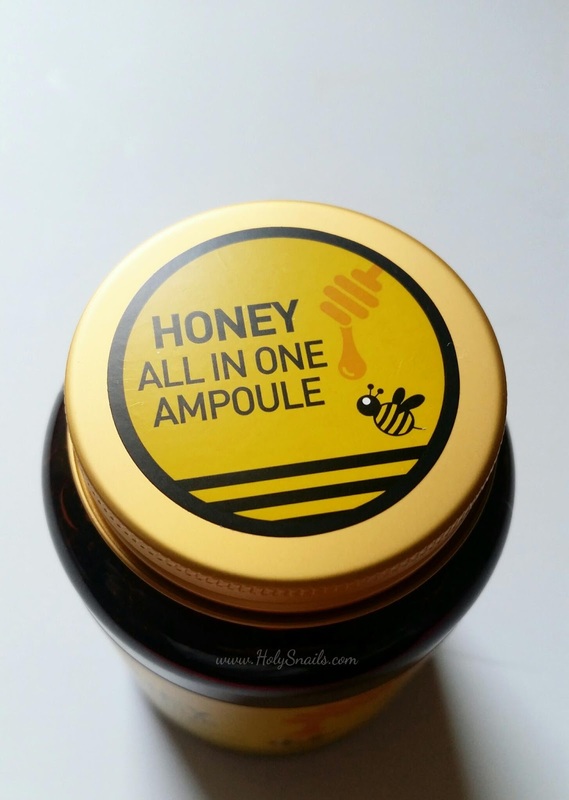 Let's face it: this is a dupe of Shara Shara's Honey Bomb All In One Ampoule. After shipping and everything, it's still less than half the price of it, but how does it compare? 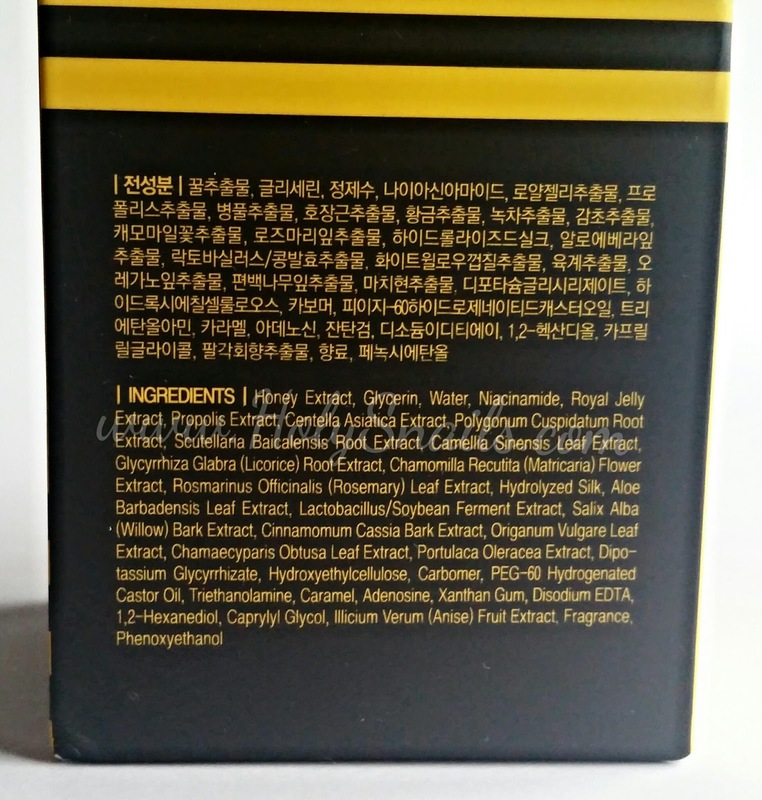 Well, I sent 50 Shades of Snail a decant of this to try, and hopefully she'll do a post on its performance vs. the Shara Shara, but let's look at the difference in ingredients. How Long Have I Been Using This? Every night for just over a month now. Such modest claims. It definitely satisfies them though. This is my Tretinoin warrior. My allergies have returned after a decade long break, and they've returned with a vengeance. Combine that with Tretinoin, and I'm a flaky mess all over again. In comes this amazing ampoule that's been keeping my flakes at bay, regardless of which other products I use with it. I notice when I swap out a different ampoule (which only happened once, to test), I was flaky all over my chin area within a couple of hours. This is also pretty soothing and calming in general. If I get a little stressed and start picking at my skin, some of this dabbed on helps so much with healing. I've only used this product as an ampoule so far, so I can't speak for its multitasking abilities. I've heard people layering it over their creams as a sleeping pack, or slathering it on as a hydrating, wash off pack. Labelled as an "All-In-One," it is suppose to be used in place of your Toner, Serum, and Moisturizer, reducing quite a few steps. To that I say: HA! Good luck taking my steps away from me. My preciousesssssss... 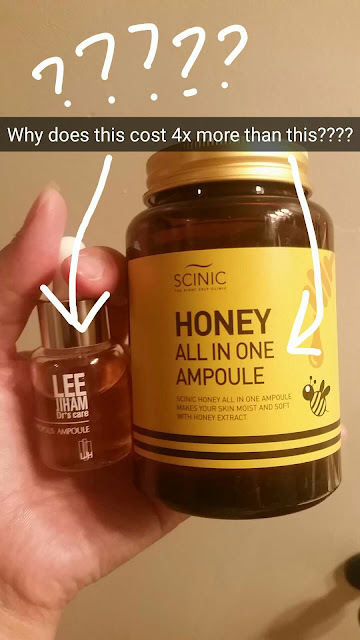 I recently snagged some LJH Vita Propolis Ampoules off of BonjourHK, and have been mixing a drop of that into my Scinic every night. It doesn't affect consistency, and it's too early to tell if it's actually doing anything new. Yikes, over contrasted. But some products that you might have already for scale. Especially the Banana Sleeping Pack. This comes packaged in a jar with a screw on lid, much like a jar of jelly. It has a large spatula that's perfect for scooping skincare - I use it for everything in my routine. I think I have to actually take points off on the packaging though, because it's seriously scary sometimes when handling it. 50 Shades of Snail has the Shara Shara AIO, which is the same type of packaging, and she recently dumped like half of it on accident. I almost did the same the other day, but caught it in time. 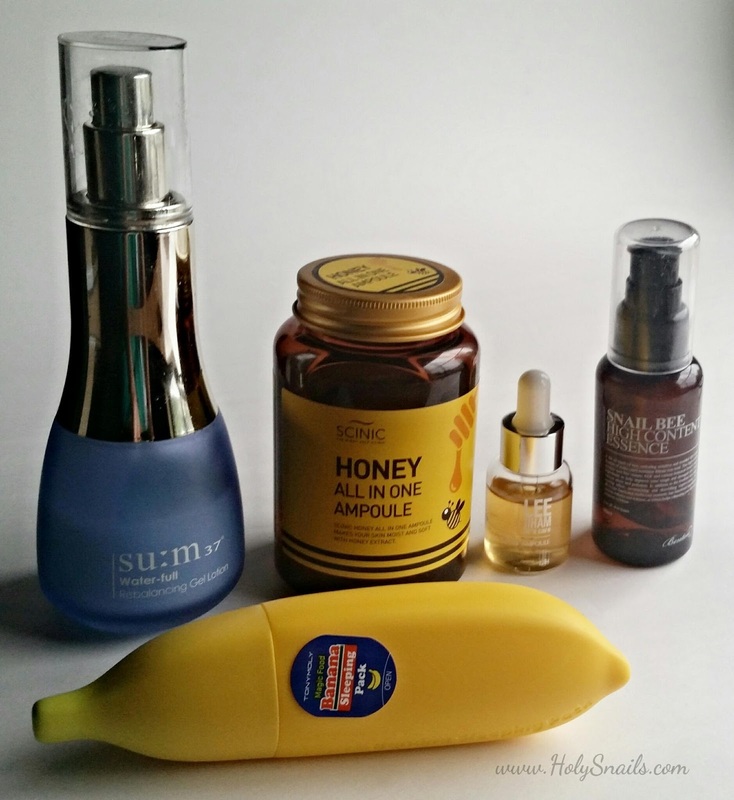 The ampoule is a good consistency: a watery gel that dries quickly and isn't sticky. It is amber colored, which I'm guessing is actually where the "caramel" in the ingredients list comes in. I have its Snail AIO brother, and that sucker is clear. The smell is actually like real honey. I feel like I should be drizzling it on my toast, and my hubby almost had a mishap in the kitchen when I brought it down to decant for some friends. Want some for yourself? You can get this through Avecko, Gmarket, 11st, or eBay. If you want to try the Shara Shara Honey Bomb to compare, you can snag that from GlowRecipe (US Shipping! ), where you can get $5 off your first order.